Although January and February are typically the slowest months for real estate, market statistics show an increase in sales activity and median and average pricing. Pending home sales increased 4.9% compared to last year, and 9.3% over January 2016. Closed sales of all single-family homes increase by 13.1% over February 2015, and almost 20% higher than January 2016. The condo market is still showing sluggish activity, with a 3% drop in closed sales over February 2015, with near the same amount of Pending Sales with only a 2.4% increase over the same period last year. Single-Family home inventory levels continue to cause concern among the real estate industry and to home buyers. In February 2016, just under 6,000 homes were on the market, representing a 9% decrease from February 2016. However, new listings are 9.6%higher than last year. 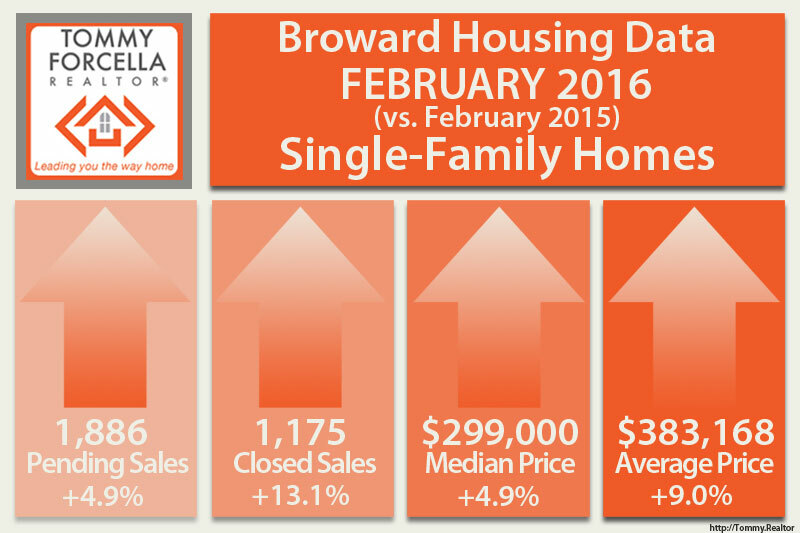 It is still a seller’s market for single-family homes in Broward County. In contrast, the condominium market inventory has exploded with over 21% more active listings than the same time last year, with almost 7 months supply of housing inventory, resulting in a buyer’s market for condominium and townhouse purchases. Traditional sales continue to show steady growth in both markets with 9% growth for Single-family home sales and 12% increase in condo/townhome traditional sales. Foreclosure sales, however, differ based on property type. While condo/townhome foreclosures continue to decline at a rate of approximately 32%, February 2016 saw a 37% increase in single-family home foreclosures. The increase in median sales price for single-family foreclosures is catching up to the traditional median sales price with a variance of only 23%. But the large amount of inventory in the condo/townhome market is keeping bank-owned condos median sales price about 35% lower than traditional condo prices. Speaking in general about my current client base, I can tell you that buyers are looking at more property than in previous years. Prospective buyers are more educated about the current market conditions, and are not jumping into a home purchase that doesn’t make sense for either their financial situation or lifestyle options. Buyers also don’t feel rushed into a purchase when interest rates are staying at historically low levels. This sometimes has not worked in the buyer’s favor, as waiting even a day can result in a home being snatched up by another buyer. Finding something similar then becomes a challenge, and the search continues on longer than expected. 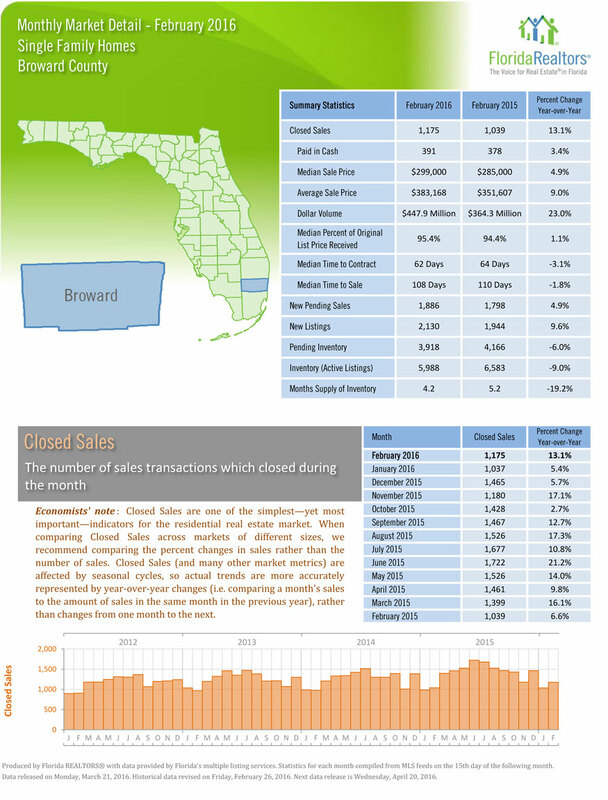 You can read and download the February 2016 Broward Market Statistics for FREE.